Mercy Wangui Kariuki. Photo courtesy of Peter Abwao for IntraHealth International. Asthma remains the most common chronic disease among children and affects 235 million people worldwide. In Africa, myths associated with the condition mean children and adults struggle not only with the health challenges associated with asthma but also from societal stigma. Bringing up an asthmatic child is a challenge for the parents, and very humbling for the child. It is from her experience growing up as an asthmatic child that Mercy Wangui Kariuki draws her passion for becoming a nurse. As I grew up, all I wanted was to be a nurse. “The tender care and support that I received from nurses and other health workers during those critical moments of my illness made me develop the desire to care,” she said at the launch event for the Afya Elimu Fund, a low-interest student loan program that helps aspiring frontline health workers afford the schooling they need and address Kenya’s health workforce shortage. Mercy told this to a crowd of over 300 delegates in Nairobi last month, including United States Ambassador to Kenya Robert Godec, Health Cabinet Secretary Dr. Cleopa Mailu, other government officials, corporate executives, trainers, and fellow students. Kenya’s Cabinet Secretary for Education Dr. Fred Matiangi, representing Deputy President H.E William Ruto, presided over the event. When Mercy took the stage on behalf of over 9,000 students who have been funded through the Afya Elimu Fund, her mission was to tell the senior government bureaucrats and private-sector functionaries—as clearly and simply as possible—that there is enough passion for health care work among Kenya’s youth to eliminate the country’s shortage of health workers, but that the fees associated with schooling are a major obstacle. Mercy’s father died when she was only three years old, leaving her and her elder brother under the care of her mother. Her mother brought the two up living off peasant farming on less than one acre of land. Growing up in the volatile Kuresoi Constituency in the Rift Valley meant that her family was not spared the instability caused by the ethnic clashes of the 1990s and early 2000s. More tragedy came for Mercy’s family when her elder brother died in a freak accident in Kenya’s Indian Ocean just after he had gotten a job with the Kenya Airports Authority. But Mercy enrolled at the AIC Kijabe Hospital School of Nursing in February 2014. And like many students from underprivileged backgrounds, she soon discovered that enrolling in college was the easy part. “The challenge of school fees became a major cause of anxiety, since my mother could only raise a small amount—barely enough to feed the family from farming,” she said. “It reached a point where I felt like hiding every time I saw the principal. The Ayfa Elimu Fund came to my rescue. 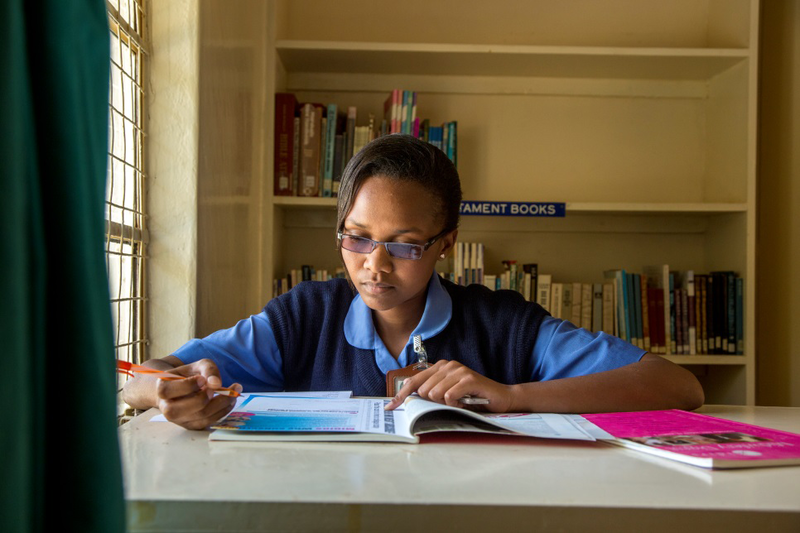 Mercy appealed to those gathered at the event to increase funding for the program, so more students like her could have peace of mind as they prepare to work on the front lines of health care in Kenya. “This launch gives a lot of hope to thousands of students out there,” she said. The Afya Elimu Fund has received more than KES 522 million (US$5 million) from various organizations, including the US Agency for International Development, the Ministry of Education through the Higher Education Loans Board, the Ministry of Health, IntraHealth International, the Standard Chartered Bank, the Family Group Foundation, I&M Bank, and the Ratansi Educational Trust. Students repay the low-interest loans to the Higher Education Loans Board after graduation, which creates a revolving fund to support more students. The Afya Elimu Fund was established by IntraHealth International’s FUNZOKenya project, which is funded by the US Agency for International Development, in partnership with the Higher Education Loans Board and the Kenya Healthcare Federation. Photo courtesy of Peter Abwao for IntraHealth International. Mercy Wangui Kariuki speaks at the launch event for the Afya Elimu Fund in Nairobi, Kenya. Courtesy of Peter Abwao for IntraHealth International.